I am sure you have all noticed that winter is coming. Most of the leaves have already fallen here and we are all wearing winter coats and hats. I always hate when the weather starts to get colder and one of the things I find difficult to get used to is bundling the kids up for the cold weather-especially a baby. It is so hard to get them to fit into their car seat correctly with a big, bulky snowsuit and many car seat experts will tell you that putting a baby into a carseat while wearing a snowsuit is outright unsafe because the straps are not fitting properly around the child. That is why the Sneak a Peek Deluxe Carseat Cover made by Jolly Jumper is so perfect for this weather and the colder weather to come. The Sneak a Peek Deluxe is a thick, toasty carseat cover that will keep your baby protected from the elements. The outer fabric is water repellent and the inner is lined with cozy, warm fleece. It has to zippers for easy in and out access and a peek-a-boo window for your baby to peek out of. 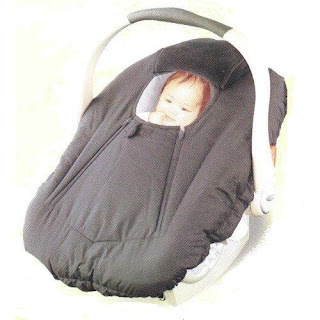 The cover fits all infant car seats and is easy to take on and off. I found that when I used the Sneak a Peek Deluxe Carseat Cover, I did not have to bundle the baby up. I put a sweater on, put them into the carseat, put on the Sneak a Peek Deluxe and then carried them out to the car. That way, the baby was totally protected from the freezing winter weather and I did not have to go through the hassle of trying to make snowsuit wearing baby fit properly into the carseat. At $24.99, it is very reasonably priced, which makes it even more tempting! Comes in black. Get yours today!! I totally feel that way too with being more selective of what you want/need with baby no.2 Quinn is using a lot of things we already had but he also got a few new things that I absolutely adore :) You look stunning mama and I can't wait to see pictures of that baby bean so soon!! It is sometimes so hard to get your baby to fit into his car seat correctly, so we should be very careful and attentive to the details when doing so! This is a very convenient solution for bad cool and very windy weather, so I will definitely buy such a sample.